A simple tool which can help you to merge your mods and avoid the "Mods limit". - New mod context menu option: "Hide from the list" which permanently hides the chosen mod from Merger mod list. Use it for those mods which you want to keep unmerged (if you need to clear hidden mods list just reset Merger settings and restart it). - Added "Select All" button. - From now if mod contains inventory icons it can not be merged. - Implemented basic internationalization support. - Added Russian GUI translation (will be loaded automatically depending on Windows locale). - Now you can save merger output log into a text file (via context menu). - Some additional checks and warnings. - New option: save merging order (enabled by default). - New option: show pause message (disabled by default). - Some misc UI tweaks. 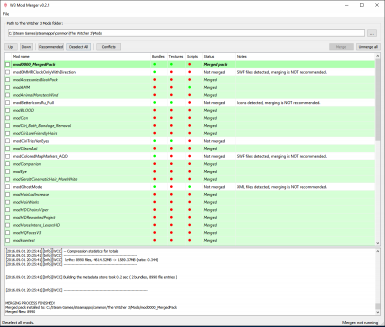 - Fixed some potential issues with Windows UAC. - No more GUI freezing during unpacking and mod installation steps. - Added some additional warnings in case of potentially incorrect Merger settings. - Bundle unpacker now extracts all bundles content including xbm files so it means that you can merge texture mods which do not have texture.cache file (like "Viper Set No Scales"). - Fixed "no files were merged" bug (occurs if merged mod auto-install was disabled). - Merger now skips cooking and cache generation steps when they are not needed (i.e. if no mods were uncooked). - Added an additional check for empty texture.cache files so it will fix endless uncooking bug (I hope). Since such mods do not need to be uncooked they will be just unpacked and merged. A simple tool which can help you to merge your mods and avoid the "Mods limit". Use it only if you have faced the limit issues, otherwise there is no need to merge anything. *If anyone needs a 32-bit version just let me know. Uncooks all *uncookable mods with wcc_lite.exe. Cooks all uncooked files (wcc). Unpacks all files from all *mergeable mods into the Cooked folder (with its own bundle unpacker). Deletes all unpacked resource files from working folders (optional). Installs mod into your Mods folder (optional). Path to wcc_lite.exe: full path to the ModKit executable. Merger will warn you if the path contains spaces, in this case you are highly recommended to reinstall the ModKit into another directory. Working folders: paths to wcc working dirs. Merger will warn you if any of these path lengths exceeds 50 symbols. Merged mod name: mod name for your merged pack. 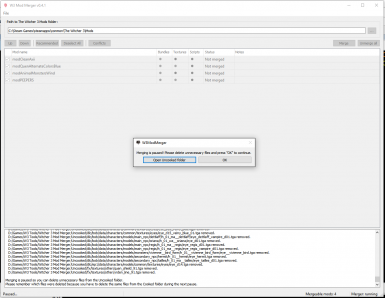 Auto install merged mod: merged mod will be automatically installed into the Mods folder. 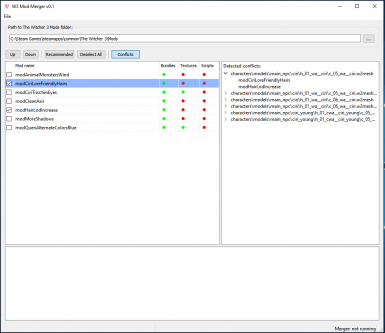 Auto clean working folders: enables working folders removal, triggers at the end of the merging process. Save merging order: stores all your mods order within the settings file. Mod list is being saved only when you press "Merge" button. If you want to clear the saved mods order just reset the Merger settings and restart it. Show pause message: use it only if you understand what you are doing! Allows you to remove unnecessary mods files after unpacking but before merging, i.e. these files won't be merged. Due to the way how the Merger works, pause emits twice: first time you have to remove all unneeded files from the Uncooked folder, next time you must remove the same files from the Cooked folder. With conflicts detector feature you can check mods conflicts on the fly and change merging order with Up/Down buttons or Drag&Drop. Mods order in the list affects merging process only but not the load order itself. Lower position in the list means higher priority. Merging can take up to 10-20 minutes so please be patient. Some mods can not be uncooked/merged so pay attention to wcc log while your first time merging and notice what mods throw a lot of uncooking errors. Sometimes you can see "Process errror: X" message - it means that wcc_lite.exe crashed for whatever reason while uncooking a certain mod. You can wait for the whole process completion or try to merge your mods again. All files from merged mods will be renamed to <filename-merged> but still kept in your Mods folder so you MUST Unmerge all before installing/uninstalling/updating your mods. Here you can find patched wcc_lite.exe which works MUCH faster than the original one.